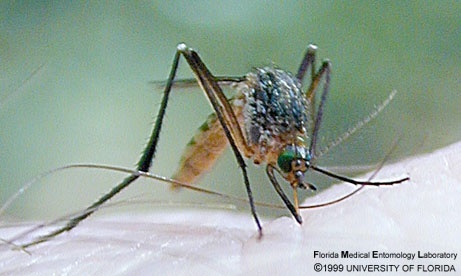 There are approximately 2,700 species of mosquitoes world wide. Fortunately, only 52 species are found in Massachusetts. These 52 species are in 11 genera; the most common genera are Aedes, Culex, Culiseta, Coquillettidia and Ochlerotatus. Each genus may exhibit a slightly different lifecycle. 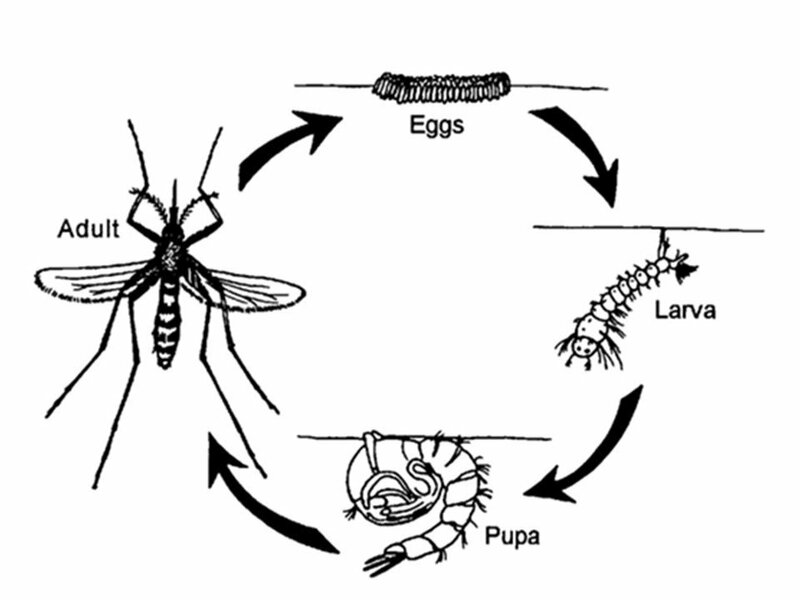 But most insects including mosquitoes have the following stages: egg, larva, pupa, and adult. 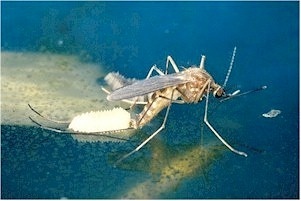 Generally, male mosquitoes emerge a few days before female mosquitoes. This gives the males a chance to mature before the females emerge. The males use their feathery antennae to hear the wings of the newly emerged females. Each mosquito species has a different sound to its wings so the males can find females of the same species. After they mate the female will look for a blood meal. Only the adult female mosquito blood feeds. She needs the energy from the blood to develop her eggs. She obtains energy for herself from nectar. The male mosquito feeds only on nectar. Not all mosquito species feed on human blood. Some mosquito species exhibit host preferences for birds or reptiles and amphibians while others do not blood feed at all. Once the female has obtained her blood meal she will find a quiet place to rest and develop her eggs. It may take several days for the eggs to develop. When she is ready to lay her eggs she will seek out an appropriate place. The site selected and the way the eggs are laid largely depends on the species and genera. The site may be the edges of a drying puddle or on the surface of the water in a container. If she is in the genus Aedes she will most likely lay her eggs singly on the edge of a drying puddle. If she is in the genus Culex or Culiseta she will lay her eggs in a raft on the surface of the water. Each raft will contain several hundred eggs. She will repeat this cycle of obtaining blood meals and laying eggs until she dies. Most females die before they obtain their second blood meal but some may blood feed two or three times. Those females that obtain two or more blood meals, are the ones that may transmit diseases since they have come in contact with the blood of several different hosts. The duration of the egg stage is largely dependent on the species and on environmental conditions. The egg stage could last from one day to years. Some mosquitoes over winter as an egg. These eggs usually must experience a cold season and a specific day length to trigger hatching. For many species the eggs will hatch in one to seven days. When the larvae are ready to hatch they use a small temporary tooth on their head to break open the egg along a suture. Because the larva's skeleton is located on the outside (exoskeleton), they must shed their exoskeleton in order to grow. All mosquito larvae shed their exoskeleton four times. These stages are called instars. The newly hatched larvae are called first instar larvae. First instar larvae are always very small and hard to see. The larvae typically float at the surface of the water. Here they can obtain food and breathe through their siphon. The siphon is located at the base of their abdomen and is similar to a snorkel. The larvae feed on bacteria and other organic matter in the water. Brushes that are located in front of their mouths collect the food. After the larvae have completed their fourth instar, they become pupae. This is the stage in which they undergo metamorphosis to become an adult mosquito. The process is similar to a caterpillar becoming a butterfly. Unlike most insect pupae, mosquito pupae are very active. The pupae don't eat but they move quickly to avoid predators. The pupae are transparent and the developing adult can be seen inside the pupal case. For example, in this picture on the left the eye of the developing adult can be seen. After one to three days the adult mosquito is ready to emerge. The pupal skin splits along the top of the case. 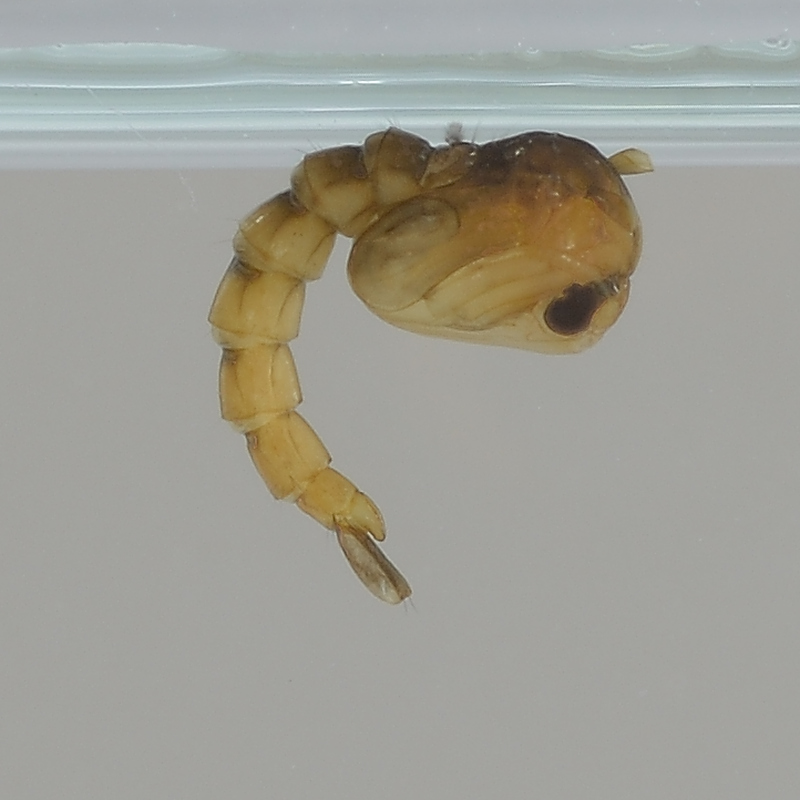 The adult mosquito slowly and carefully works its way out of the pupal case. After emerging it will float on the surface of the water and rest there until its body and wings harden. Once the body has hardened the mosquito will be able to fly and begin its new life.